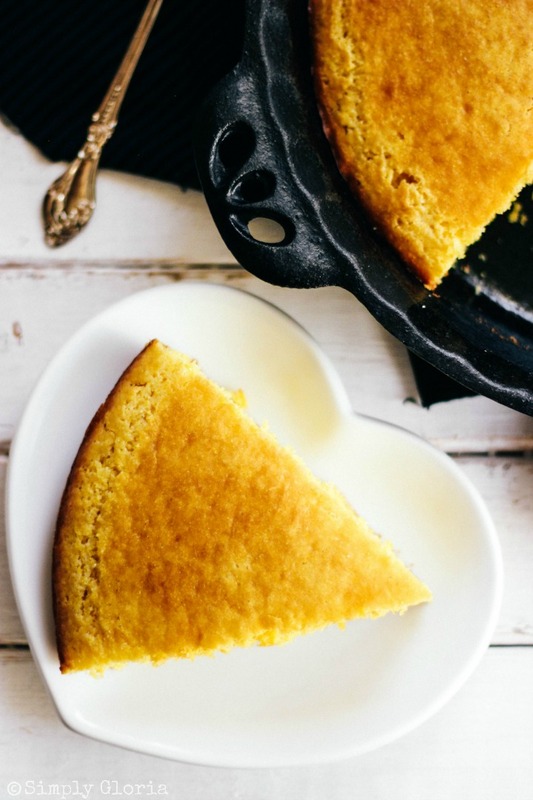 An Easy Golden Cornbread recipe with a touch of sweetness and buttery, crunchy edges that will have you going back for more! I’m sharing with you an easy and simple way to make quick cornbread all from scratch! There’s nothing like the fresh smell of hot cornbread coming out of the oven! Every time I make this cornbread, it is devoured right away. No leftovers of this ever lingering. 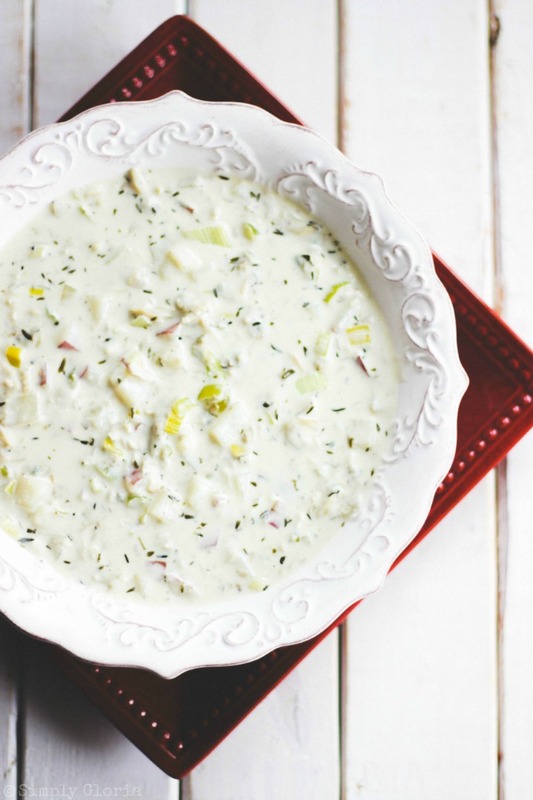 In fact, this recipe is my little East’s favorite to whip up. It’s that simple to make! The texture of the cornbread is very tasty with the right amount of cornmeal. Then, just a little bit of sugar added to balance the savoriness of the quick bread. 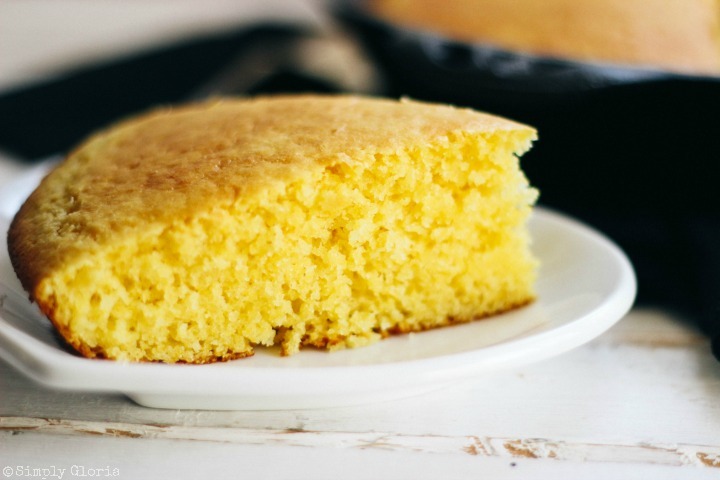 The full recipe of this scrumptious cornbread is down below. But first, I wanted give you an idea of just how easy this is to put together and bake! Once you’ve whisked all the dry ingredients together, add the milk and egg mixture with the melted butter. 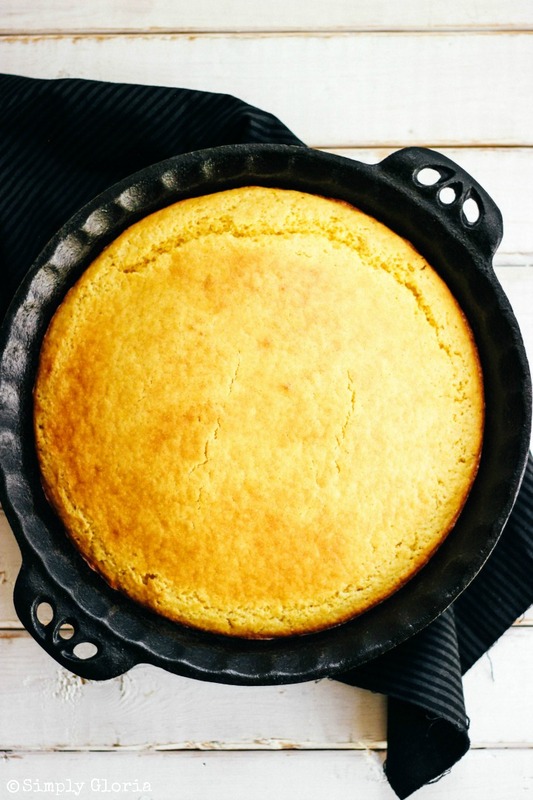 Pour the amazing cornbread batter into a 9-inch greased cast iron skillet (or pie pan) and bake! 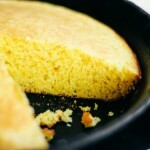 As promised, down below is this Easy Golden Cornbread recipe. 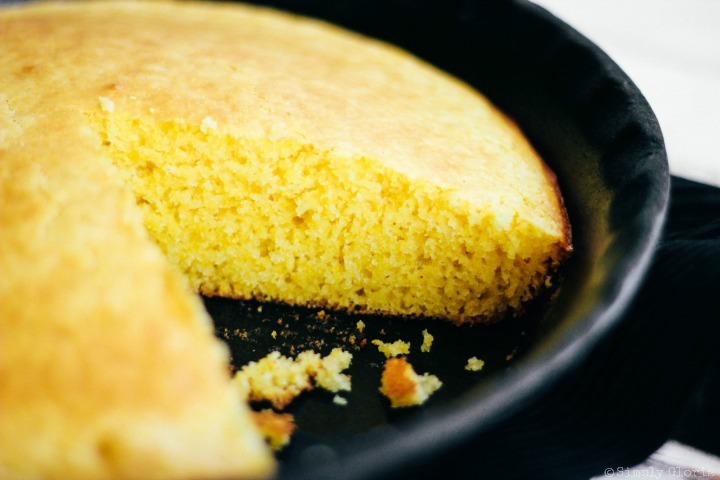 Have a piece right of the oven with a pat of butter…and you’ll be in cornbread heaven! This recipe is simple to make and the taste is super moist with a crunchy crust! 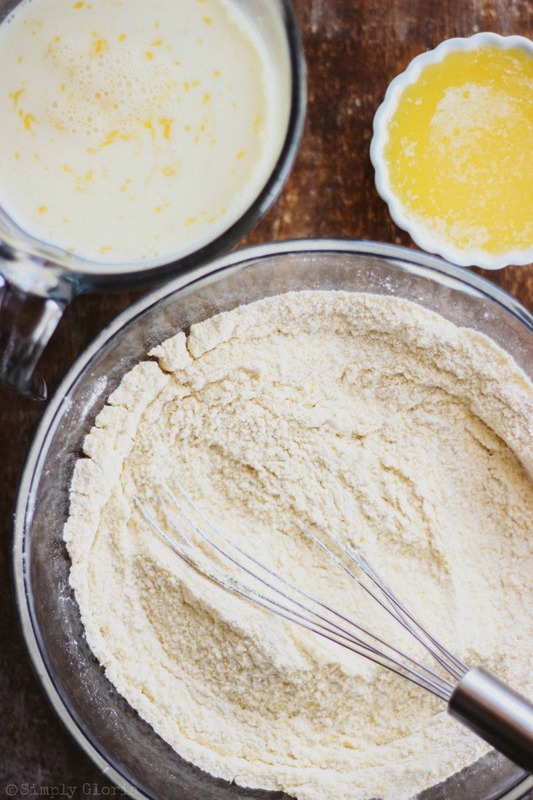 In a large mixing bowl, whisk together flour, cornmeal, baking powder, sugar and salt. Set aside. Combine milk and egg in a separate bowl. (Or simply add the egg to the measured milk and whisk together.) Melt butter. Add the milk and egg mixture and the melted butter to the flour mixture. Stir with a spoon until all combined. Pour into a greased 9-inch cast iron skillet (pie pan or baking dish) and bake for 25 minutes or until lightly golden brown on top. Serve immediately. Store in a closed container for the next day for any leftover pieces. I absolutely love corn bread! This recipe sounds perfect; slightly sweet, crunchy top and moist! Yum! Another way I enjoy my cornbread, is with cheddar cheese mixed in with chopped jalapeño’s. So, good! Tahny, that is right up my alley…the cheese and jalapenos! That’s my favorite, too. Happy Monday! Gloria, we love corn bread and this looks delicious. 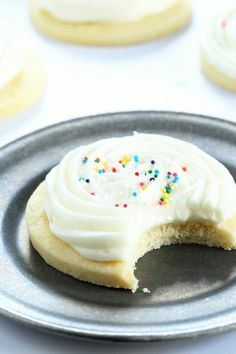 Love this easy recipe for something so yummy! Thanks for sharing – pinning and buffering. Hope your weekend has been great and your Sunday is happy! Thank yo so much Cindy! You have just made my day! Love how easy this is to make. I could go for a nice hot piece slathered with buttah!! 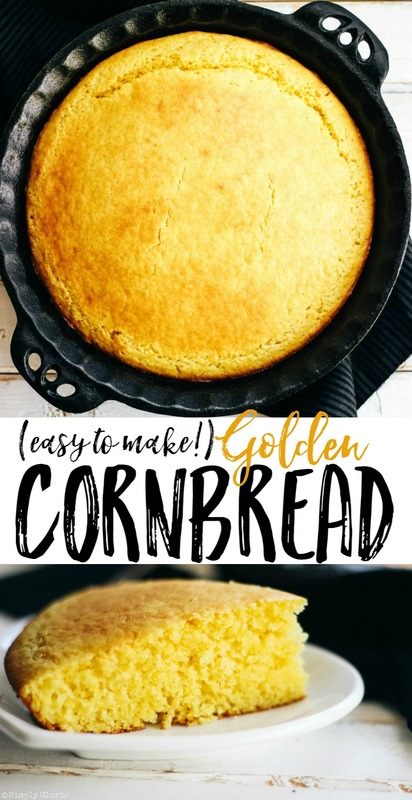 I love corn bread, I also love corn bread mixture before it’s cooked, so I’m going to be all over this! Definitely will be making this for dinner this week! Corn bread is one of my all-time favorites! This looks incredible! I DO love cornbread straight out of the oven! This looks great! 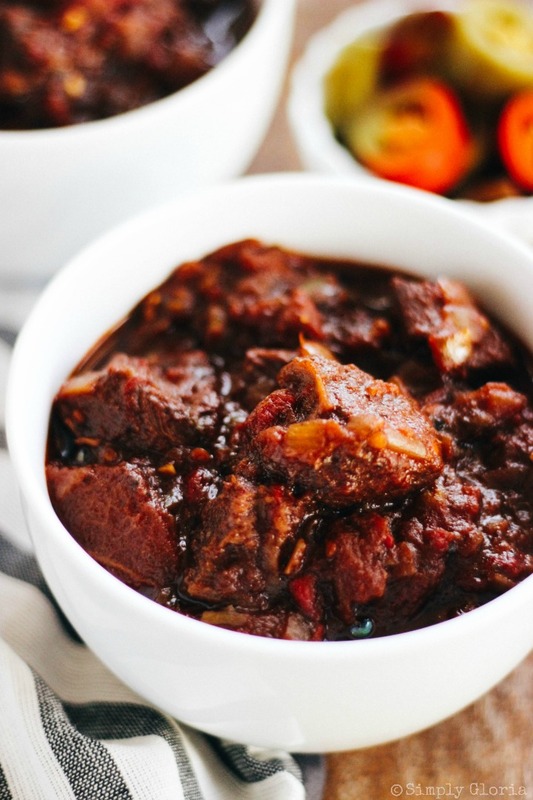 It’s so good with chili! Now, I’m getting hungry…it IS dinner time! Thanks, Lisa! I love Polenta so I know I am going to love this. I have never tasted cornbread but from what you have written and the mouthwatering pictures, I can’t wait to try it out. Lovely Gloria! Mmm I could almost smell it!! I will have to make this very soon!! Jocelyn, let me know when you make this…you’ll love it! Cornbread is my favorite! All of your pictures are stunning. Looks absolutely DELICIOUS! Thanks for the recipe!